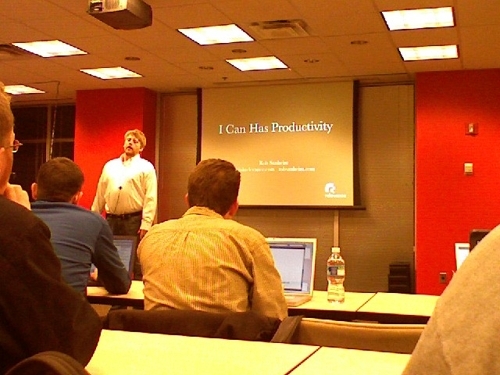 I attended a talk by Rob Sanheim, a priciple at ThinkRelevance, on productivity entitled "I Can Has Productivity". Rob also talked about efficiency vs effectiveness, or in other words, doings things right vs doing the right things. Something else he talked about, which is probably the hardest for me, is time management and how it can help you determine your time-wasters and find more time in the day. This is something we could all use, because who doesn't need more time? He also recommended a few books, including "The Pragmatic Programmer", which I've read, "The Effective Executive", and another gtd-related book from someone at 37signals. Despite having already heard a lot of this from various other places, all in all this was still a pretty interesting talk, especially with the comment/questions from the group and the heavy use of LoLcats in his slides. 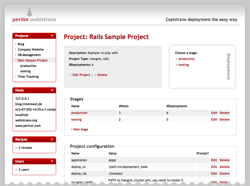 If you don't know what Capistrano is, then you've probably never deployed a Rails app. Formerly known as SwitchTower, Capistrano is a tool that takes the pain out of deploying a Rails app. By simply typing "cap deploy", Capistrano will grab your code from Subversion, push it up to your host, restart your server, and even run any necessary migrations. Ain't that slick? Check out Webistrano. It's a UI for managing Capistrano deployments, which they claim wil help in dealing with multiple projects in multiple environments. Introducing Vlad the Impaler, uhh... I mean Vlad the Deployer. No, its not a vampire, its the Ruby Hit Squad's attempt at cleaning up the code and simplifying the use of Capistrano. Brendan, Theo, and I at Social Matchbox DC the other night. More Pics. Initially we thought this was going to be a venue for local start-ups to talk about themselves and what they were up to. Unfortunately it turned out to be more like a job fair. One after another, company representatives briefly spoke about what their company was about and then proceded to rattle off a lits of positions that they were looking to hire for. During the social segment of the evening, everybody I talked to that I didn't already know sounded more like a recruiter than a like-minded web entrepreneur. Despite opting for the "Socializer" name tag rather than the "Job Seeker" alternative, I begrudgingly accepted a handful of business cards from various people in need of web developer/software engineers.